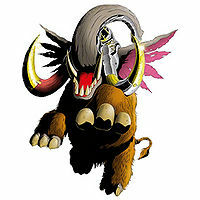 The fact that this ancient Digimon existed long ago was made clear from a multitude of evidence. Due to Digital World warming, its super-compressed data was expanded, and it made its way from the once-icebound Ice-Snow Area. 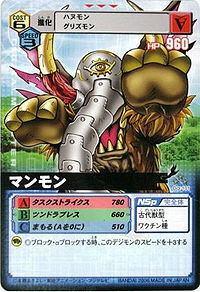 Its whole body is covered in dense fur, and although it is an ancient Digimon that possesses immense power, it also has a weakness to extreme heat. The crest engraved into the mask covering its face is a super-ancient crystal of wisdom, so it possesses the power of clairvoyance so that it is able to see far into the distance, and its large ears can even identify sounds from faraway places. 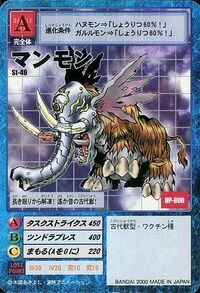 Its Special Moves are skewering the opponent with its two elongated tusks (Tusk Strikes), and spewing cold breath out of its long trunk in one burst, instantly freezing any opponent (Tundra Breath). 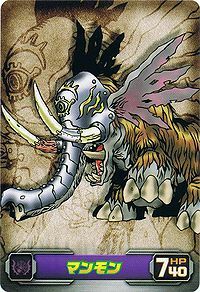 The fact that this ancient Digimon existed long ago was made clear from a multitude of evidence. Due to Digital World warming, its super-compressed data was expanded, and it made its way from the once-icebound icy snow Area. 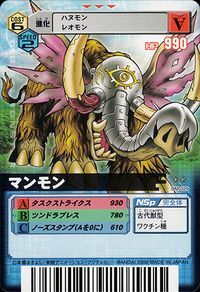 Its whole body is covered in dense fur, and although it is an ancient Digimon that possesses immense power, it also has a weakness to extreme heat. The crest engraved into the mask covering its face is a super-ancient crystal of wisdom, so it possesses the power of clairvoyance so that it is able to see far into the distance, and its large ears can even identify sounds from faraway places. 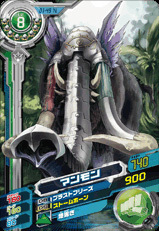 Its Special Move is stabbing the opponent with its two elongated tusks (Tusk Strikes). — Digimon Adventure: "Mammon, the Great Clash at Hikarigaoka!" 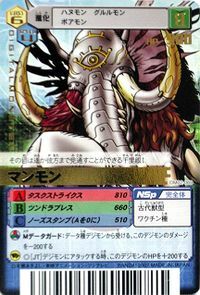 — Digimon Adventure 02: "Mysterious Ruins, The Holy Stone"
— Digimon Savers: "The Singing Voice that Calls Upon a Miracle, Lilamon Evolve"
n., From mammoth 「マンモス Manmosu」, from the wooly mammoths of the Ice Age. 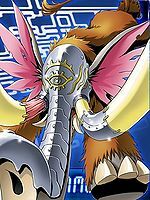 Anime/Manga Digimon Adventure: "Mammon, the Great Clash at Hikarigaoka!" 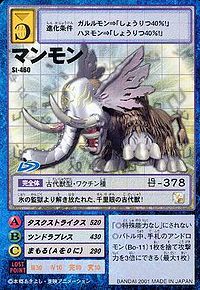 Tusk Strikes  タスクストライクス Tasuku Sutoraikusu Tusk Crusher Skewers the opponent with its two elongated tusks, or fires its tusks like missiles. 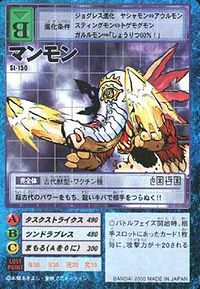 Tundra Breath  ツンドラブレス Tsundora Buresu Freezing Breath/Snow Breath Spews cold breath from its long trunk all at once, instantly freezing any opponent. Fires a hard frozen snowball from its trunk. 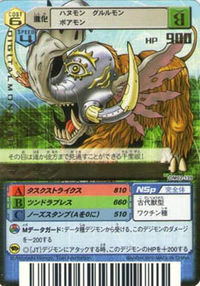 Hits the opponent with its trunk. A Mammon was sent to the real world by Vamdemon. 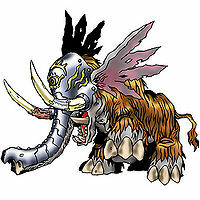 A Mammon was among the many Digimon seen through the rip in the sky during Vikaralamon's rampage. As the DATS team travel through the Infinity Ice Ridge, they are ambushed by a Mammon under the orders of Gottsumon. As a result, it causes an avalanche which separates the team including Ikuto. It later gets put to sleep by Lalamon and finally gets defeated by Lilamon. Mammon evolves from Hanumon (0+ DP), Shima Unimon (0+ DP) or Unimon (0+ DP) and evolves to Skull Mammon (0+ DP). 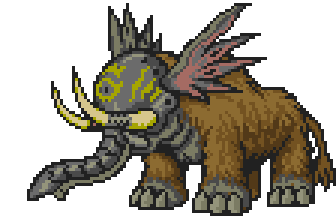 Its technique, Tusk Strikes costs 18 MP and attacks all opponents. Mammon appears as a boss. 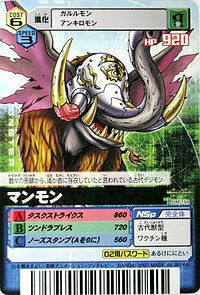 Can be evolved from Mojyamon if above level 35, attack 180, and defense 185, or can be found at Access Glacier. 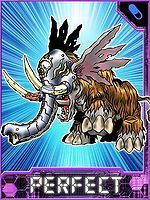 Can evolve to Skull Mammon if above level 49, Dark EXP 6000, and Beast EXP 8000. Evolves from Gururumon, Centalmon, Geo Greymon, V-dramon, Mojyamon or Unimon. Can evolve to Skull Mammon. 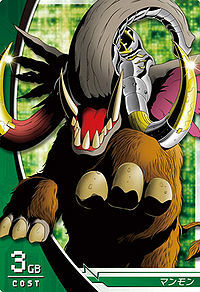 Mammon is available as a Digimon Medal. Evolves from Hanumon or Garurumon. Can evolve to Skull Mammon. Mammon is an enemy Digimon in Area 05, 06 and 07. Evolves from Geo Greymon, Gawappamon, Peckmon, Gaogamon, Reppamon or Karatuki Numemon. Can evolve to Shine Greymon, Jumbo Gamemon, Mirage Gaogamon, Sleipmon or Ravmon. Can also Burst Evolve into Beelzebumon or Belphemon. Thawed from a long sleep! An ancient beast from the distant past! Has very ancient powers. It cuts through the enemy with its sharp tusks!! This clairvoyant ancient beast was released from a prison of ice! An ancient Digimon said to have existed in the distant past, judging from various pieces of evidence. Its eye is an all-seeing eye that sees even the farthest reaches of the earth clearly! 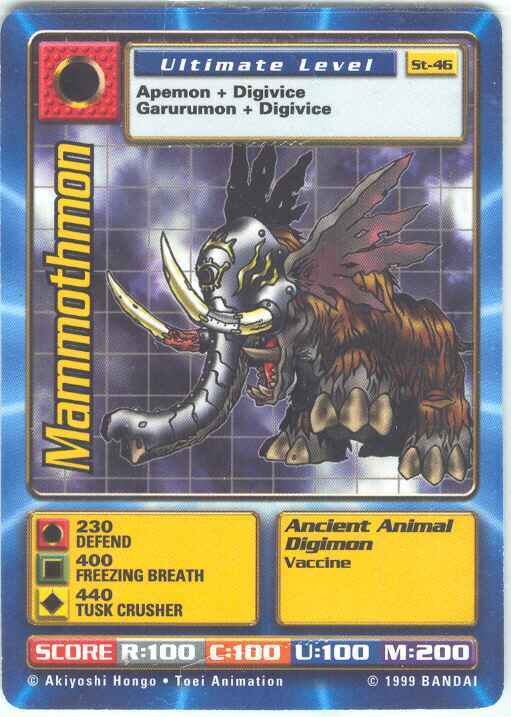 An Ancient Beast type Digimon that existed long ago. 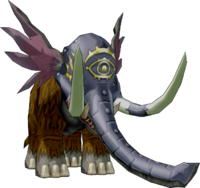 It battles using its gigantic body and ancient, tremendous power as its weapons. An ancient Digimon discovered when an icy area melted out due to the warming of the Digital World. It possesses clairvoyance which allows it to see through all, due to the carving on its mask made by the crystal of knowledge. ↑ "Release date of Digital Monster Ver. S (September 23, 1998)"
This page was last modified on 21 March 2019, at 17:34.